Objective Early identification of patients with rheumatoid arthritis (RA) is essential to allow the prompt institution of therapy. The 2010 American College of Rheumatology (ACR)/European League Against Rheumatism (EULAR) classification criteria, which replace the 1987 classification criteria, have been developed to facilitate such identification in patients with newly presenting inflammatory arthritis. This study therefore assesses the performance of these new criteria in patients with early synovitis. Methods Data were analysed from patients with synovitis seen within 3 months of the onset of inflammatory arthritis. Patients were followed for 18 months to determine outcomes, and data on the cumulative fulfilment of 2010 and 1987 criteria and therapy were recorded. Results 265 patients were included in the study. 60 had alternative diagnoses at baseline. Of the remaining 205 patients, 20% fulfilled both 1987 and 2010 criteria, 3% fulfilled only 1987 criteria and 22% fulfilled only 2010 criteria at baseline. The 2010 criteria, when applied at baseline, detected more patients who eventually required disease-modifying antirheumatic drugs (DMARD) (65 (62%) vs 40 (38%); p<0.001), especially methotrexate (50 (68%) vs 31 (42%); p<0.01), within the first 18 months. However, more patients whose disease eventually resolved without ever requiring DMARD were classified at baseline as RA according to the 2010 criteria than with the 1987 criteria (16 (8%) vs 5 (2%); p=0.01). Conclusion The 2010 ACR/EULAR criteria allow more rapid identification of patients requiring methotrexate compared with the 1987 ACR criteria when applied at baseline. However, overdiagnosis is an important issue to consider if these criteria are to be used in very early disease. An important aim of the new classification criteria was to identify individuals at high risk of persistent and destructive disease, who might benefit from disease-modifying therapy. Consequently, an important phase in the development of the criteria was the identification of factors, and their relative weights, which were associated with a clinical decision to start methotrexate within the first 12 months. This was carried out through analysis of data from 3115 patients, with no evidence of alternative diagnoses, from nine early arthritis cohorts.9 This was followed by the evaluation of case scenarios to determine the relative contribution of clinical and laboratory factors deemed to be important in influencing the probability of developing RA.10 Finally, the findings of these first two phases were integrated and the optimal cut-off for definite RA was established.8 This development process was therefore reliant upon the ability of experts to identify high-risk patients correctly and start treatment with methotrexate. Nevertheless the approach avoids the inherent circularity of developing new criteria from existing criteria. The purpose of this study was to compare the performance of the 1987 and 2010 criteria in a very early synovitis cohort, comprising patients who presented within 3 months of the onset of inflammatory arthritis symptoms and who were systematically followed up to determine outcomes. This is an ideal population to study in this context because it includes patients who develop persistent RA, but were seen within a very short time frame after disease onset—the very situation for which the new criteria have been constructed. Importantly, our cohort was not used to develop the 2010 criteria, so is free from the inherent bias this would generate. Validating criteria for RA is problematical given the absence of a gold standard pathology-based diagnostic test against which clinical criteria can be compared. For this reason, we initially sought to compare the 2010 criteria against the 1987 criteria. This comparison is crucial for several reasons. First, there is an extensive epidemiological and clinical trials literature that has been developed utilising the 1987 classification system. Ascertaining the degree of overlap between the criteria will help establish the extent to which previous research can be generalised to patients classified under the new system. Second, for the 2010 criteria to be useful, they must be capable of identifying RA more rapidly than the 1987 criteria. It is important to note that a positive classification using the new criteria does not necessarily imply a clinical diagnosis of RA. However, in developing the 2010 criteria, the identification of patients at risk of persistent disease requiring disease-modifying antirheumatic drug (DMARD) therapy, in particular methotrexate therapy, was a key goal. We thus analysed whether the 2010 classification criteria were better able to identify patients who eventually required DMARD treatment. Patients were recruited from the rapid access early inflammatory arthritis clinic at Sandwell and West Birmingham Hospitals NHS Trust. Patients referred to the clinic by their general practitioners were seen within 2 weeks. Participants were included in the current study if: (1) they had clinically apparent synovial swelling at one or more joints at their initial assessment; (2) they were seen within 3 months of the onset of any symptom attributed by the assessing rheumatologist to inflammatory joint disease (pain, stiffness and/or swelling); and (3) they had been followed up for at least 18 months. Data were collected on patient demographic variables, fulfilment of the 1987 ACR criteria (using the list format) and symptom duration. Tender (n=68) and swollen (n=66) joint counts were performed. C-reactive protein (CRP), erythrocyte sedimentation rate (ESR), rheumatoid factor (RF) and anti-cyclic citrullinated peptide (CCP) antibody type 2 status were measured. These were used to calculate scores under the new 2010 EULAR/ACR criteria, on the basis of joint involvement, serology, acute phase reactants and symptom duration.8 Radiographs were performed of the hands and feet. Systematic clinical follow-up, including metrology assessment, was carried out at 1, 2, 3, 6, 12 and 18 months and CRP and ESR were measured at these time points. Data on therapy used during follow-up were also collected. Autoantibody status was measured at baseline only. Patients were classified as having self-limiting disease if at final follow-up (at 18 months) they had no clinical evidence of synovial swelling, were not taking DMARD and had not received glucocorticoid treatment in any form in the previous 3 months. Several important points should be highlighted regarding our application of the 1987 and 2010 criteria. First, the 2010 criteria stipulate that patients with a likely alternative diagnosis such as systemic lupus erythematosus (SLE) are excluded from analysis. Moreover, this process is under continuous review such that during follow-up an increasing number of patients are excluded. Indeed, a patient initially meeting the 2010 classification criteria for RA at baseline will have their RA status reversed if it later becomes apparent that their symptoms are due to another condition. Such an exclusion process is not explicitly mentioned in the 1987 criteria, but is widely adopted in practice. We have therefore applied the same approach for both the 2010 and 1987 criteria. The second issue relates to the cumulative fulfilment of criteria. This issue is not explicitly addressed within either the 1987 or 2010 criteria, although cumulative fulfilment for the 1987 criteria is widely adopted in practice and we have allowed for cumulative fulfilment in both criteria sets. In the context of the 2010 criteria, the maximum score within each of the four domains is carried forwards during follow-up. Data analysis was performed using the statistical package for social sciences, version 17.0. Patient groups classified using each system were compared in terms of demographic variables, serology, joint involvement, treatment and outcome after 18 months of follow-up. Differences in means were assessed using a two-tailed, unpaired Student's t test. Proportions were compared using a χ2 test. The time to reach a diagnosis of RA (of patients diagnosed by both criteria) was compared using a Wilcoxon signed rank test. The latter data were presented graphically as a cumulative percentage of patients reaching an RA diagnosis in survival plot format. p Values less than 0.05 were considered significant. Patients gave their informed consent before inclusion in the programme. The study received ethical approval from the local research ethics committee. Two hundred and sixty-five patients were included in the study. One hundred and thirty-seven (52%) were women and the median age was 49 years (IQR 35–64 years). Patients were seen after a median symptom duration of 42 days (IQR 25–61); all were seen within 3 months. Patients had a median tender 28-joint count of 2 (IQR 1–6), tender 68-joint count of 3 (IQR 1–7), swollen 28-joint count of 2 (IQR 1–5) and swollen 66-joint count of 3 (IQR 1–5). Median ESR was 27 mm/h (IQR 11–53 mm/h) and median CRP was 21 mg/l (IQR 6–51 mg/l). As shown in figure 1, 60 patients had alternative diagnoses at baseline (reactive arthritis n=22, psoriatic arthritis n=12, gout n=10, pseudogout n=5, inflammatory bowel disease-related arthritis n=4, SLE n=2, sarcoidosis n=2, dermatomyositis n=1, Behcet's disease n=1 and septic arthritis n=1). They were therefore excluded from RA classification criteria. Of the remaining 205 patients, 41 (20%) fulfilled both the 1987 and 2010 criteria at baseline assessment. There were also, however, patients only classified as RA using one or other criteria. 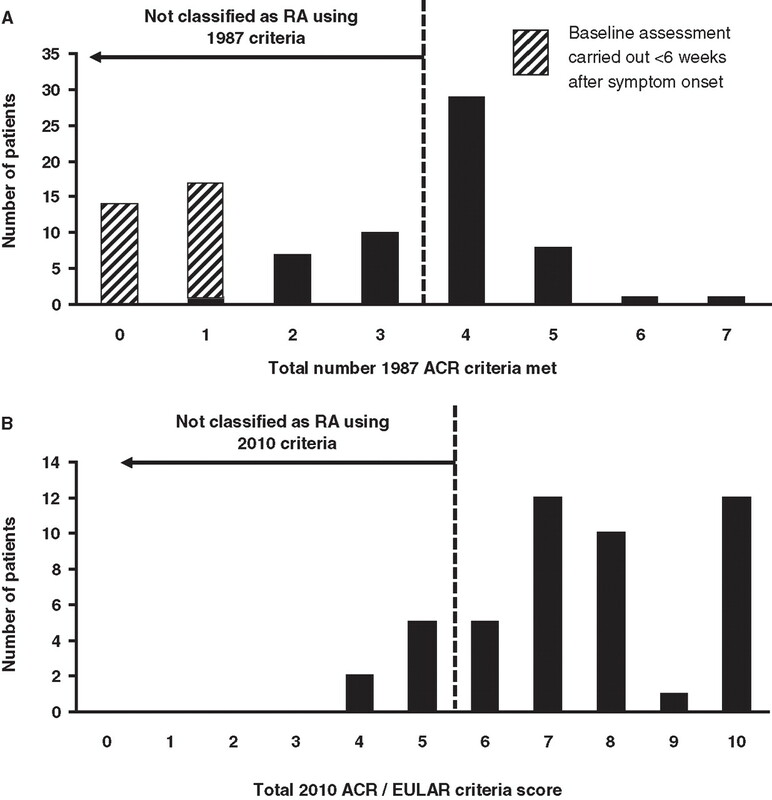 At baseline, six of 205 (3%) patients were identified as RA only by the 1987 ACR criteria, but a greater number of patients (46 of 205 (22%)) were only classified using the 2010 criteria. Flowchart of patients in the early arthritis cohort to compare classification of rheumatoid arthritis (RA) using the 1987 and 2010 criteria. Fourteen patients in the cohort developed new symptoms, signs or other features during follow-up that led to an alternative diagnosis and therefore became excluded from the classification criteria during follow-up, although they were included in all baseline analyses. Of the remaining 191 patients, at some point during the 18-month follow-up, 76 (40%) patients fulfilled both the 1987 and 2010 criteria (not necessarily simultaneously). Sixteen (8%) patients were classified under only the 2010 criteria and 20 (11%) patients under only the 1987 criteria. As discussed above, when calculating the 2010 criteria score at follow-up, the maximum score from each of the four domains was carried forward. However, it should be noted that this ‘cumulative’ approach only resulted in one additional RA classification compared with a ‘non-cumulative’ analysis. A direct comparison was made between patients classified as having RA using the 1987 and 2010 criteria (table 1). Among the 205 eligible patients in the cohort, the 2010 criteria identify far more patients at baseline compared with the 1987 criteria (87 (42%) vs 47 (23%), respectively; p<0.0001). Among patients requiring DMARD (n=105), these criteria also detect more patients at baseline for whom DMARD were prescribed by 18 months (65 (62%) vs 40 (38%), respectively; p<0.001), especially methotrexate (50 (68%) vs 31 (42%) out of 73 patients requiring methotrexate; p<0.01). Data regarding the sensitivity and specificity, positive and negative predictive values and positive and negative likelihood ratios of the two sets of criteria when applied at baseline for subsequent DMARD use and methotrexate use are shown (table 2). Receiver operating characteristic curves for the identification of patients requiring DMARD and methotrexate based on the two sets of criteria when applied at baseline are also shown (see supplementary figure 1, available online only). The percentage of patients eventually requiring DMARD among those identified as RA at baseline is similar for the 2010 criteria and the 1987 criteria (65 (74%) vs 40 (85%), respectively; p=0.16). Importantly, more patients whose disease eventually resolved spontaneously were classified with RA according to the 2010 criteria than with the 1987 criteria (16 of 205 patients (8%) vs five of 205 patients (2%); p=0.01). This includes over a quarter of the patients classified as RA solely by the 2010 criteria at baseline (table 3). The proportion of patients fulfilling each set of criteria that were autoantibody positive was comparable. 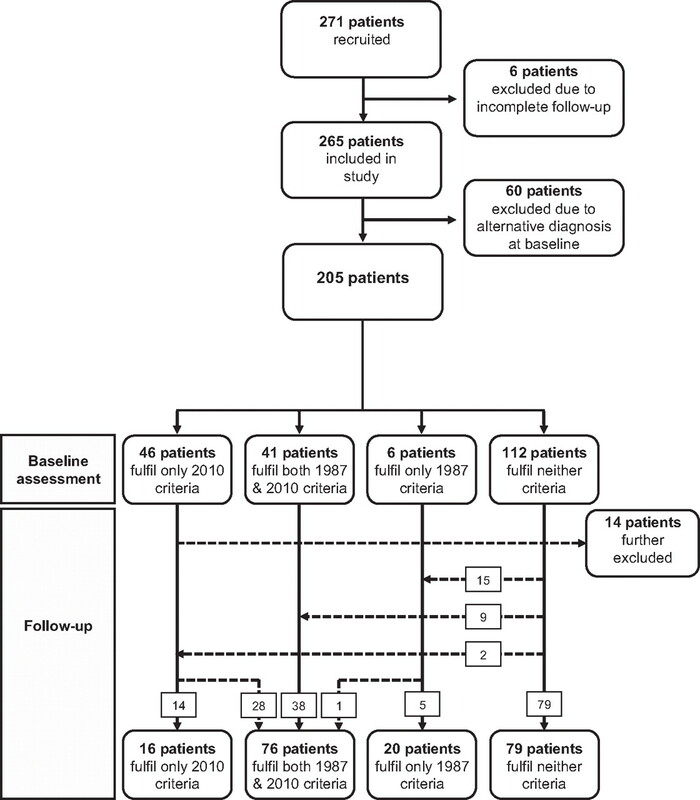 After 18-month follow-up, the numbers of patients classified using the respective criteria were similar (96 patients with the 1987 criteria vs 92 patients with the 2010 criteria). These patients were also similar in age and gender. By this stage, fewer patients requiring DMARD were identified according to the 2010 criteria compared with the 1987 criteria, although the differences were not statistically significant. Data regarding the sensitivity and specificity, positive and negative predictive values and positive and negative likelihood ratios of the two sets of criteria, when applied during follow-up, for DMARD and methotrexate use are shown (table 2). There were seven more patients classified as RA based on the 2010 criteria who had a self-limiting illness (21% vs 13%). After follow-up, there were no patients with a definitive diagnosis other than RA because these patients had been excluded. The diagnoses of those patients with RA according to the 1987 and 2010 criteria at baseline that were no longer considered to have RA at follow-up were as follows: 2010 criteria: SLE (n=2), psoriatic arthritis (n=2), inflammatory bowel disease-related arthritis (n=1), Sjogren's syndrome (n=1), gout (n=1); 1987 criteria: SLE (n=1), Sjogren's syndrome (n=1), psoriatic arthritis (n=1). Next, patients were divided into groups depending upon whether they fulfilled both, one or neither of the classification criteria at baseline (table 3). The ‘2010 only’ group contains an even mixture of seropositive and seronegative patients. Half of these patients were started on methotrexate in the first 18 months. However, 12 (26%) had a self-limiting illness. By contrast, it is interesting to note that only four (10%) patients fulfilling both criteria at baseline had a self-limiting illness. Furthermore, 27 (66%) of the patients fulfilling both criteria at baseline required methotrexate. By the end of the 18-month follow-up, there remained several patients who at some point fulfilled only one of either the 1987 or 2010 criteria (table 3). All 20 patients classified as RA under only the 1987 criteria were RF and anti-CCP negative, but 12 (60%) of these were started on methotrexate and the majority (80%) had persistent disease. The 16 patients classified only under the 2010 criteria were again predominantly seronegative. However, 11 (69%) had self-limiting illness and only three (19%) were started on methotrexate. Most autoantibody positive patients were identified as RA by both criteria. The group of patients classified under both criteria again contained smaller proportions of self-limiting illness and higher numbers of those requiring methotrexate. To characterise further the patients classified as RA at baseline according to the 2010 criteria, a histogram of the 1987 ACR criteria scores was constructed for these patients (figure 2A). All patients with a score of 4 or more would have met the 1987 criteria for RA. As illustrated, many patients with low 1987 scores were seen before 6 weeks. Therefore, by definition, they could not fulfil any 1987 clinical criteria at baseline. This is an important reason why the 1987 criteria classify so few RA patients at initial presentation compared with the 2010 criteria. Ignoring the 6-week symptom duration rule would result in 22 additional patients meeting the 1987 criteria at baseline (giving a total of 69 patients classified) and would account for 17 of the 46 (37%) patients only classified according to the 2010 criteria. (A) Total number of 1987 criteria present at baseline in patients classified as rheumatoid arthritis (RA) according to the 2010 American College of Rheumatology (ACR)/European League Against Rheumatism (EULAR) criteria. (B) Baseline 2010 criteria scores in patients classified as RA according to the 1987 criteria. A histogram was also constructed to show the 2010 criteria scores of the patients diagnosed according to the 1987 criteria at baseline (figure 2B). This shows that there are seven patients with a score less than that required for a classification of RA by the 2010 criteria and that this is only by 1–2 points. One of these patients had radiological evidence of erosions and thus prima facie evidence of RA under the 2010 criteria. To assess whether the 2010 criteria offer a more rapid identification of RA in the early stages of disease, the time to meeting criteria for RA under both systems was assessed. This showed that patients are identified significantly earlier using the 2010 criteria (p<0.01; figure 3A). (A) Time to classification of rheumatoid arthritis (RA) using the 1987 and 2010 RA criteria for all patients classified as RA under both criteria. (B) Time to classification of RA using the 1987 and 2010 RA criteria for all patients with an eventual diagnosis of persistent unclassified inflammatory arthritis or RA, and started on methotrexate. Next we compared the proportions of patients requiring methotrexate identified by the different criteria at baseline. Of the total of 73 patients started on methotrexate, a significantly higher proportion of patients fulfilled the 2010 criteria than the 1987 criteria at baseline (50 (69%) and 31 (43%), respectively, p<0.01; figure 3B). It should be noted that some of these patients (although not excluded at baseline) did reach an alternative diagnosis, such as psoriatic arthritis, during follow-up. The results remain significant even if these patients are excluded. Patients with a baseline classification of RA using the 2010 criteria had significantly longer median symptom duration at presentation than non-RA patients (45 days (IQR 35–67) vs 42 days (IQR 24–62); p=0.02). This is unsurprising given that the new criteria themselves include a score for duration of disease. However, even after stratifying for patients with a duration less than 6 weeks (ie, duration score of 0), patients with RA still had a significantly longer median symptom duration than those with non-RA disease (31 days (IQR 27–35) vs 23 days (IQR 14–30); p<0.01). Further analysis was performed selecting only patients classified with RA using the 2010 criteria at baseline. Patients requiring DMARD had a significantly longer median symptom duration at presentation compared with patients not needing treatment (56 days (IQR 35–75) vs 42 days (IQR (34–56); p=0.03). Many patients who eventually fulfil the classification criteria for RA according to the 1987 ACR criteria present with an undifferentiated arthritis. The need to identify those whose disease will progress to RA has prompted the development of predictive algorithms that have been validated.11 12 A recognition of the potential utility of criteria to identify early arthritis patients who will develop a persistent destructive disease unless treated appropriately has led to the development of the ACR/EULAR 2010 criteria. Data from our cohort show that significantly more patients presenting with an inflammatory arthritis of less than 3 months' duration are classified as RA at baseline according to the 2010 criteria, compared with the 1987 criteria. Some of this is explained by the 6-week symptom duration rule contained within the 1987 criteria, which prevents classification of patients as RA if seen within 6 weeks of the onset of their symptoms. However, 29 of the 46 (63%) patients only classified according to the 2010 criteria would not have been classified according to the 1987 criteria at baseline, even if the 6-week rule was disregarded. Do these additional patients, diagnosed only according to the 2010 criteria, really have RA? Importantly, 65% of these patients were positive for RF or anti-CCP antibody. Furthermore, 65% of these patients required DMARD therapy during follow-up. However, equally importantly, 12 (26%) of these patients had a disease that resolved without DMARD therapy over an 18-month follow-up period. Basing treatment decisions upon fulfilment of the 2010 criteria would thus lead to more rapid treatment in some patients for whom this is likely to be beneficial, at the cost of the overtreatment of significant numbers of patients. During the validation of the 2010 criteria three cohorts were studied from Leiden, Leeds and Toronto. Among the cohort participants who received methotrexate within the first year from symptom onset, the proportions with a score of 6/10 or greater ranged between 87% and 97%.7 This contrasts with only 50 of 73 (69%) in our cohort who received methotrexate within the first 18 months. Therefore, almost one third of patients who were deemed to require methotrexate during follow-up (and did not have an alternative rheumatological diagnosis at baseline) did not fulfil the 2010 criteria for RA at baseline. The 2010 criteria were developed specifically to identify patients with RA at an early stage. It is, however, interesting to note that during follow-up there were 20 patients who fulfilled the 1987 criteria for RA who were not diagnosed according to the 2010 criteria. Despite the fact that none of these patients were positive for RF or anti-CCP antibody, 70% of them were commenced on a DMARD. Our data suggest that the 2010 criteria will allow the more rapid identification of patients requiring methotrexate compared with the 1987 criteria if applied at baseline, but highlight that over and underdiagnosis may become important issues if these criteria are used to direct treatment within the phase when treatment makes the greatest difference—the first 3 months after symptom onset. The authors are grateful to Kanta Kumar for helping to maintain the clinical database from which the data for this study were extracted.
. The Michael Mason prize: early rheumatoid arthritis–the window narrows. Rheumatology (Oxford) 2010;49:406–10.
. Long-term impact of delay in assessment of patients with early arthritis. Arthritis Rheum 2010;62:3537–46.
. The 2010 American College of Rheumatology/European League Against Rheumatism classification criteria for rheumatoid arthritis: methodological report phase I. Ann Rheum Dis 2010;69:1589–95.
. The 2010 American College of Rheumatology/European League Against Rheumatism classification criteria for rheumatoid arthritis: phase 2 methodological report. Arthritis Rheum 2010;62:2582–91.
. Persistence of mild, early inflammatory arthritis: the importance of disease duration, rheumatoid factor, and the shared epitope. Arthritis Rheum 1999;42:2184–8. Funding This work has been supported by grants from Arthritis Research UK and the European Community's Sixth Framework Programme (AutoCure). Competing interests KR, AF and CDB hold unrestricted research grants from Wyeth, UCB and Cellzome. Ethics approval This study was conducted with the approval of the Birmingham East North and Solihull Research Ethics Committee.